Please e-mail boat owner Bob at Bob@rmbuckbuilders.com for more information. 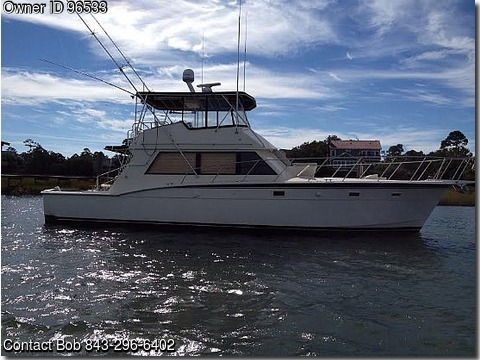 GPS new 2010, fishfinder/depthfinder, reconditioned 20kw Westerbeke generator, 40'outriggers, center rigger, enclosed flybridge, fighting chair, radar, new 2010 engine room fire suppression system, EPIRB, VHF, Two staterooms, sleeps 6, head w/ new flooring, 2 showers, H&C water, galley down, refrigerator, stove, TV/DVD new 2013, storage, huge salon. Well maintained, 700 hundred hours on twin 8V92 Detroits SMOH completely rebuilt in 2010. This boat is documented, prof. maintained, the slip is available, and willing to work trade for 27 Contender or Whaler.